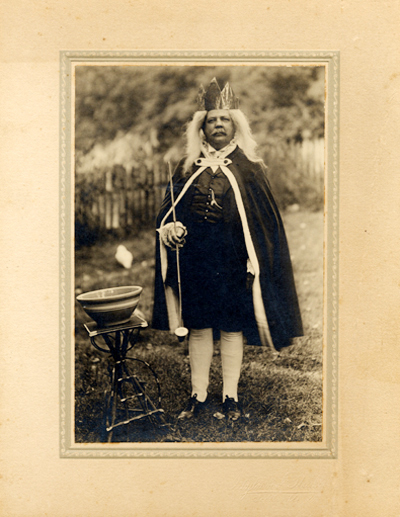 Comments: Sam Gault dressed up as 'Old King Cole' for a 1914 entertainment at Miss Hannah Moore's Hall on Valley Street. Miss Hannah converted an old brick factory building near her home into a theater where plays were a rich source of entertainment in Scottsville. For over a decade, Miss Hannah's Hall was a focus for the town's social life. Many home-grown and imported plays were enacted there with a canvas backdrop and illuminated by white wax candles with tin reflectors. The Hall eventually became unusable after a fire. In 1918, Victory Hall was completed on Valley Street and replaced this hall as the center of Scottsville theater life. Sam Gault became postmaster for Scottsville in 1893, a position he would hold for forty-six years. Until 1914, the Scottsville post office was located on Valley Street between the National Bank of Scottsville and the Beal Building. Leaning over his mail counter at latter location, Postmaster Sam was always ready to chat. Sam also was 'Mr. Social,'	arranging many of the town's gay parties for Scottsville's young people.